Block.one is the the world’s largest blockchain developer and author of the EOSIO software. 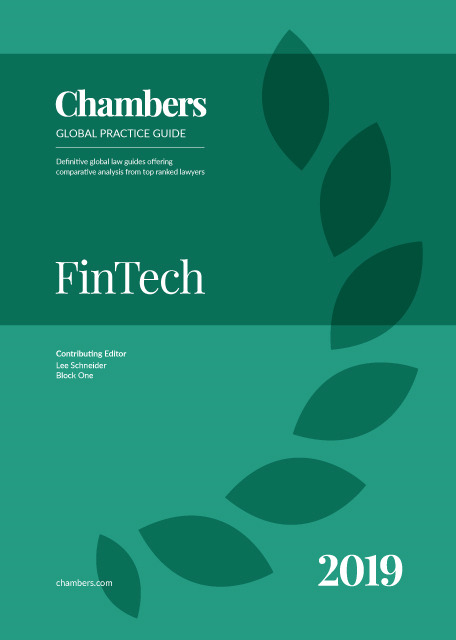 As Chambers and Partners expands its focus on financial technology or the “FinTech” practice area, this introduction offers up several broad ideas for consideration, seeking to bring into sharper relief both the practice area and its practitioners. My own experience as a FinTech lawyer began advising financial services clients in the mid- to late 1990s, first as an outside lawyer and then in-house at a large financial services institution. Most of that work was regulatory/compliance in nature, along with the business counselling that comes with an in-house role. I quickly realised that technology plays a major role in most activities at a financial services organisation. From my focus on broker-dealers, I watched as technology overtook all aspects of the trading, clearing and settlement of securities transactions, as well as the risk-management and compliance functions. Regulators also recognised this trend, as a consequence adopting many new rules designed both to encourage technology and to provide guardrails for its usage. Some of the software was built internally but, increasingly, specialist software companies provided niche products to the brokerage industry. Once embedded with a broker-dealer, these companies sought to expand their product offering with additional software that either produced new functionality or handled additional aspects of the original processes. From my vantage point, “FinTech” has developed within the financial services sector as a result of both internal and external phenomena. The FinTech industry has matured since those early days and is now worthy of a discussion that captures its rich and varied impact on the modern financial industry. This introduction will cover the many areas of law included in a FinTech practice. Finally, the article summarises some trends in FinTech gleaned from wider experience within the sector. FinTech companies use existing or new software to provide financial services or to assist existing financial services-providers, from a business, sales, product, regulatory, or risk-management standpoint. While quite expansive, this definition captures the essential nature of both the technology and financial services components of FinTech. One might add that such a definition should encompass both new entrants in financial services whose technology stack is built from scratch as a means to rethink the delivery of products, services and compliance, as well as legacy players who utilise technology to adapt existing processes. Moreover, it should include pure technology players who do not themselves provide financial services even though their software is used for the provision of such services. It is also worth noting that many consider that FinTech companies might by nature include providers of hardware. A useful refinement of the definition might require the use of technology to disrupt, to reimagine, to expand a service-offering, to inhabit a niche, or to offer new ways for people to participate in their financial lives. Adding such a requirement of some type of “disruption” captures something of the ethos behind the start-ups in the space, while leaving room for the legacy players to challenge their existing notions about how financial services can be best or most usefully delivered. There is also a discussion to be had about whether FinTech applies only to retail financial services or also to financial services for institutional clients. It is my opinion that there is no reason to limit FinTech to retail customers because the innovations that occur for institutions transfer to retail, and vice versa. One example of this trend is the online brokerage industry, which traces its roots to the computerised trading offered to institutional customers. Also, many institutional clients (such as mutual fund complexes) serve retail consumers, so the benefits to institutions indirectly accrue to retail. A final point worth emphasising is that the above definition encompasses all financial services. In many ways, it is fair to say that, nowadays, every aspect of financial services uses technology. It might be said that a FinTech lawyer is both a financial services and technology lawyer. The best practitioners will combine knowledge of the business and regulation of financial services with a detailed understanding of the technology, or at least a great curiosity about how it works in each particular implementation. FinTech can be considered as a practice area comprised of the many areas of law that make up financial services, with an overlay of technology lawyering. In this taxonomy, FinTech lawyers cover, among other areas, the business and regulation of insurance (life, healthy, property and casualty), retail-brokerage services, institutional securities' trading, banking of all sorts (deposit accounts, lending, fiduciary and custody services), commodities' trading, structured products of all types, securities and commodities clearing and settlement, and payment services, as well as the attendant intellectual property and technology issues arising from the different technologies deployed by the different players in each segment. Financial services firms have been adopting technologies for quite some time, and certainly before the “FinTech revolution.” NASDAQ was founded on computerised trading. Dematerialisation of stock certificates started in the early 1980s, paving the way for computers to clear and settle stock trades. Banks also adopted computerised record-keeping at around the same time. As with the definition of the FinTech industry itself, the idea of a FinTech lawyer is inclusionary in nature, rather than exclusionary. Because of the breadth of the industry, many different areas of legal expertise are implicated. Transactional, regulatory, and intellectual property lawyers all advise FinTech companies. Enforcement lawyers also play an important role when regulatory matters move from inquiry to investigation. Blockchain is real, but it has a long way to go. Blockchain’s impact is more likely to be transformational than marginal. It is not a fad. Cryptocurrencies are just one application of the technology. Blockchain technology allows people to do a variety of consequential things that can reimagine their participation in the digital world, such as give people more control over information about themselves, more effectively track goods to keep us safe, buy and sell securities in new ways, and carve up property rights through digitisation. Blockchain’s great promise is its ability to promote economic activity and foster community. Regulation always matters. It matters in that too much regulation can snuff out technological advances, while too little regulation can allow for misconduct that undercuts investor and consumer confidence. It also matters in that businesses, whether they are start-ups or well-established enterprises, value regulatory clarity so that they can more readily distinguish between the permissible and the impermissible as they look to develop and refine compliance programmes. With innovation comes the need to reassess the appropriateness of relevant regulatory regimes to make sure they still fit, not only with where technology is, but also with where technology is going. As technology changes, we should continue to consult the first principles that underpin the marketplace and our legal and regulatory environment – transparency, competition, investor and consumer choice, accountability, anti-fraud, privacy, security, and the like. First principles are just that, because they are the foundation upon which we build, because they make good sense, and because they have proven to be robust as technology and other things have changed around us. Sometimes, emerging technologies provides new ways of looking at longstanding first principles, or may suggest including some additional first principles that recognise the potential daily impacts and future horizons of technological change. We should be alert to updating our perspective when new insights are at hand. “Social” is characteristic of FinTech. FinTech companies routinely rely on social media; more profoundly, they often centre their offerings on building community – bringing people together to transact, to share a common experience, or simply to cheer for each other. Many FinTech business models depend on the network effects that arise when people buy in and the whole becomes greater than the sum of the individual participants’ interactions and contributions. Crowdfunding is just one aspect of this trend. Even with amazing technology or a revolutionary idea, it still takes a tremendous amount of work to start a company and make it successful. When founders talk about this point, they use words like passion, dedication, focus, and teamwork. They also hope for some good breaks. What appears to be “overnight success” probably occurred because of years of hard work by a dedicated team. Capital is the lifeblood of both businesses and individuals. A terrific business model and game plan is unlikely to succeed without financial resources backing it. Individuals also require funding to pay the bills, weather unexpected difficulties, and invest in themselves and loved ones, such as through education. Innovative FinTech companies are helping capital, whether through investments or loans, to get to the companies and households that need it. From the practitioners' perspective, these themes raise several key issues. First, regulators in several jurisdictions have adopted so-called “sandboxes” that will allow businesses admitted to the programme a degree of freedom from regulation to encourage experimentation but with greater regulatory oversight and monitoring to lessen the chances that customers will be harmed. FinTech lawyers can support their clients by being knowledgeable about the application process as well as the terms and requirements for sandbox participation. They can also advise on the transition from the sandbox to the normal regulatory framework and what to expect from a compliance standpoint post-sandbox. With the recently announced cross-border co-operation on sandboxes by several regulators in Europe, North America and Asia, FinTech companies may look for opportunities to scale their businesses to a multi-jurisdictional client base, so cross-border expertise from law firms will be needed. Second, FinTech companies are evaluating the different disclaimer and disclosures that they need to make as well as the terms of their end-user or customer agreements. They seek to take more of a “plain language” approach that more clearly explains concepts and avoids extraneous disclosures of speculative possibilities. This desire poses challenges for lawyers who would normally want to cover every potential eventuality, no matter how remote. Regulatory requirements and regulator preferences also need to be considered in the drafting process. Also important is the target client-base, particularly for FinTech companies looking to serve the unbanked and the underbanked who may lack certain basic knowledge about financial products. Third, global regulators are focused not just on the licensed financial services firms but also on their vendors and outsourced providers. Vendor management, including provisions that allow regulators to have access to the vendor and impose requirements on the vendor around service levels, indemnification and audit rights pose a challenge for contract negotiations. Lawyers representing both the licensed entity and the vendor need to understand the requirements in order to be effective for their clients. FinTech includes both licensed companies and service-providers, so the issues arise across the industry. Fourth, cybersecurity and data privacy are essentially opposite sides of the same coin. Good cybersecurity helps protect data privacy and good data privacy practices enable cybersecurity. Some FinTech companies seek to provide solutions in these areas, others try to educate their customers to reduce the burdens associated with breaches, lost data and insecure access. In an era of social financial services and information-sharing, determining how to balance client desires, evolving standards and machine-learning capabilities remains a delicate exercise for lawyers advising companies. Governmental standards vary across jurisdictions and those standards are constantly changing as the threat vectors change and technologies evolve. The FinTech practitioners who disregard these important areas of the law do so at their peril. Fifth, various jurisdictions have several layers of regulators. For example, Europe has regulations adopted by the European Union but with Member State-specific implementations. In the United States, certain areas of financial services are left solely to the states or solely to the federal government, but other areas have combined regulation. Canada has differing regulations by province. Lawyers without the sophistication on these issues will have a difficult time giving effective advice. The world of FinTech involves many aspects and is fuelled by people seeking to use technology to create a simpler experience that is just better all the way around. Many of them believe in the power of technology to improve the lives of people. We FinTech lawyers are privileged to try to help them succeed.